My background is neither horsey nor arty. I grew up between the jute mills and ironworks of a very bleak Scottish city in the 70s. The environment was rather grim but I was obsessed with horses from infancy and cannot remember a time when I didn’t draw them. I suppose they represented a form of escapism but, years later, they are still as fascinating as ever. On my eleventh birthday I bought myself my first box of oil paints and that was a life-changing experience. 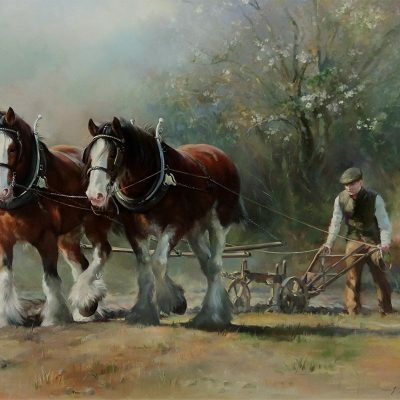 Oils, better than any other medium, capture the full range of textures and colours that make up the horse. With experience they are easily managed, can be applied thickly or thinly, quickly or with painstaking precision. They can be painted over or wiped away – ideal for a young impatient artist desperate to improve. At fourteen I executed my first commission, a formal portrait of the mighty Nijinsky, my first real equine hero. Every penny I made was spent on trips to the races – from Musselburgh to Longchamp. (Once, I ‘bunked off’ school to visit Perth races and found my maths teacher there doing the same thing!) Those trips provided all the inspiration I needed, but I soon discovered how much more colourful and glamorous was flat racing compared to the jumps (and warmer too). Group 1 racedays were a wonderful spectacle and made a huge early impression on me. Great horses stole my breath away…it was utterly mesmerizing for someone from such a modest background. Art College was never a consideration for me. I detested art at school (tie–dying T-shirts and papier maché sculptures were not for me). They gave me the art prize every year I was there – even when I didn’t take it as a subject! Painting horses in oils was the only kind of art that interested me. Privately commissioned work takes up much of my time. I work very closely with the racing and breeding community (my most exacting clients), and am in the hugely privileged position of being able to paint for my own pleasure while always having commissions to execute. From the world’s finest racehorses to the most beloved family pet, I approach all my commissions the same way. Ideally, I will meet the subject and instinctively recognize all the features that make him unique. Knowing other members of a racehorse’s family is beneficial: like humans, horses inherit all their characteristics and the details of their appearance can be traced back for generations. Even as a teenager I would be fascinated by those details: Grundy’s and Shergar’s almond-shaped eyes, the pronounced bony orbits of the Nijinsky-types, the pretty pony faces of the Mill Reefs. Commissions require more discipline and less expression. Capturing the likeness is everything. Bringing all that gathered information to the canvas so that it is both pleasing to the eye and correct is the object of my work. The popularity of equine art never seems to wane and I truly believe that there is a little strand of DNA dedicated to the human appreciation of the horse. We share the same history. Man and horse have worked, hunted, fought and played together for thousands of years. Choosing the most athletic animal for the job was all part of our survival. 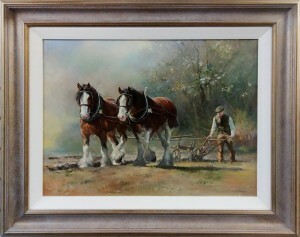 Horse paintings simply reflect our admiration and affection for our most loyal servant. Sargent, Millais and Waterhouse are my favourite artists. Stubbs will always be the master horse painter; Munnings’ gypsy and horse-market scenes are still the best examples of how paint should be applied with confidence. I love the Tate but dislike the Tate Modern. I cannot help thinking that beauty is a casualty in the modern artist’s rush to express himself. There is a real sense of looking at “the emperor’s new clothes” and being too fearful to dismiss rubbish for what it is. I’ve no idea how to describe my style. I hope it is sympathetic. The pleasure that is found in painting loose, sunny, lively scenes with an over-sized brush is immense. I like to think that I’m versatile enough to produce successful impressionist scenes and rather sober portraits when I’m asked. There are no rights and wrongs in this business – it’s a matter of personal taste and the onlooker should have the freedom to decide what he/she likes. If the artist enjoys the work it will show through. The greatest challenge is always managing the light. A studio at each of the Earth’s poles would be handy. A work always looks different as the light changes and all the artificial daylight in the world cannot replicate a bright, northern day. Daylight equates to time and, like everyone else, there doesn’t seem enough for me to do all that I want to do. There is always a horse that I would love to paint but cannot find the time. It is the only downside of having a career I love.